The Church and the Libertarian With the wit and penetrating analysis Remnantreaders have come to expect from him, Ferrara carefully considers all the arguments, even those advanced by radical libertarians, exemplified by the so-called “Austrian School,” to help you answer the one question that matters most: What am I -- Capitalist? Libertarian? Socialist? As a Catholic, where must I stand? Far more than a tale of woe, however, this book presents a stunningpositive case for Catholic Social Teaching as the one way back to civilizational sanity. 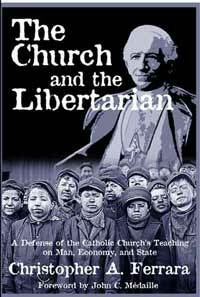 The Church and the Libertarian presentspractical ways of restoring true liberty in present circumstances, including a Catholic vision of "microeconomic life" in a world veering madly toward both political and economic collectivism, the latter imposed by so-called “free” market entrepreneurs as much as it is by government.